After years of speculation and anticipation, Avengers Infinity War finally opened this weekend and did huge numbers at the box office. Marvel fans have waited six years to finally see Thanos on the big screen, The Russo Brothers did an amazing job showcasing his power as a villain. Infinity War picks up immediately where Thor: Ragnarok leaves us, the Asgardian ship is wiped out by Thanos and his Black Order, leaving Thor and Loki. The Russo Brothers promised us a crazy first five minutes of this movie, and they delivered. Thanos kills Loki, throws Hulk into space, and destroys the ship leading to Thor floating in space. Thanos begins his quest to gain all six Infinity Stones scattered across the universe. What Infinity War does the best is balance the characters and their screen time. 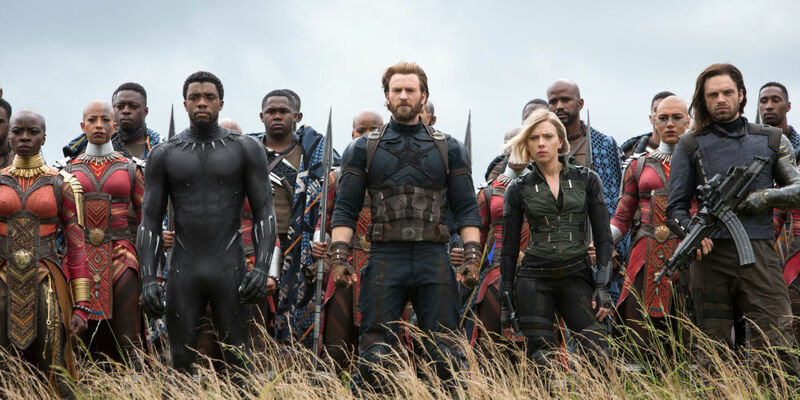 You would jump from Iron Man’s team to Thor, Rocket, & Groot on their mission, over to Thanos and whatever havoc he was causing, to Captain America’s team in Wakanda. It felt balanced and each group would get a good amount of time focused on them before jumping to the next group. One of the MVP’s of this movie aside from Thanos and Iron Man was Spider-Man. The mentor relationship between Iron Man & Spider-Man just continues to grow and this may have been the best we’ve seen of Tom Holland as Spider-Man. Spider-Man’s “death” towards the end of the film is probably the most gut-wrenching of them all for most fans. Thankfully we know he will be back along with Black Panther. A big concern fans had with this movie was the villain. It’s a fair statement to pause and think about since we’ve gotten villains such as Whiplash, the Mandarin, & Malekith. But the past few MCU movies have made some improvements with the likes of Vulture, Hela, Erik Killmonger, and finally Thanos. Thanos has been teased since the end of the first Avengers movie. Over the past few years, we’ve gotten slight changes to his look but no more than five minutes of footage of him. Marvel did a great job hiding him from us, but then they unleashed perhaps their best villain yet. Thanos was a one-man wrecking crew, but he did have a heart, a common theme of the last few MCU villains. This led to some of the film’s most emotional moments between him and his daughter Gamora. Despite him sounding crazy for wanting to wipe out half of the universe, you see that he believes he is right. One negative of this movie was Captain America’s role. His entrance to the movie was really cool, but we don’t get as much of him as anyone thought. On top of that, he seems so different and because we haven’t really seen him since Civil War, it was a bit hard to connect with the character again. It’s not to say he wasn’t good in the film, he was great especially towards the end of the film in the final battle, his role just wasn’t as fulfilling as many thought it would. Another negative was the Soul Stone. Over the years we’ve slowly been introduced to the Infinity Stones. At this point, we knew where all of them were except for the Soul Stone. Many thought it’d pop up in Thor: Ragnarok, others thought it’d come in Black Panther. We didn’t even get a hint of it in either of those films which led to some really crazy theories. In the end, it turned out to be on a planet they have never been to in the movies. It felt like a little bit of a letdown, considering how much we’ve invested thinking about it, but it led to Gamora’s sacrifice which was definitely a tear-dropping scene. The ending of Infinity War is crazy, we see Thanos snap his fingers and people start disappearing. Spider-Man, Groot, Drax, Winter Solider, and Doctor Strange are just a few of the people to “bite the dust” in this film. Though it doesn’t seem they will all be dead for long, the movie makes you feel for them since they got us very attached to these characters.